This project was the second of two projects aiming to create 'safe speeds' around rural schools. In rural school environments safety concerns arise from the conflict between high speed through traffic and school drop off and pick-up activities. The process began with a meeting at each school to discuss safety concerns and possible solutions. Variable speed limit (VSL) signs were subsequently developed for each school; 40km/hr, 60km/hr, 70km/hr LED signs depending on the existing posted speed limit and opertional speeds. The signs were activated during school pick-up and drop off times each day. 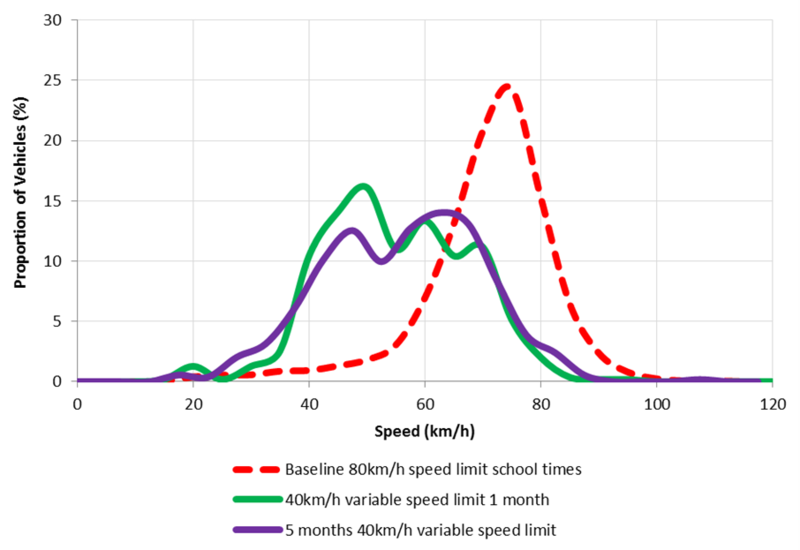 Speed data collected pre-installation, post installation, and 5-12 months on showed that the VSL signs were effective in reducing vehicle speeds during school pick up and drop-off times. The signs were perceived to be effective by school communities. The trial also showed that a 60km/hr school VSL in a 100km/hr posted speed limit area was effective in reducing speeds. As a result of the trial a number of recommendations have been developed to support the development of rural school VSL signs and general rural school road safety.